Science Study Series No. 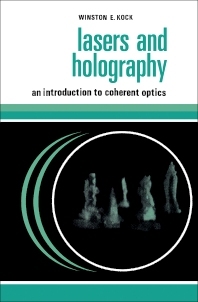 39: Lasers and Holography: An Introduction to Coherent Optics focuses on the processes, methodologies, and techniques involved in optics, including wave diffraction and patterns, zone plates, holograms, and diffraction. The publication first ponders on holograms as wave patterns, coherence, and lasers. Topics include reflectors and resonators, natural line width, semiconductor lasers, reflectors and spatial coherence, energy conservation with reflectors, frequency coherence and stability, coherent waves from small sources, photographic grating, and properties of waves. The book then tackles wave diffraction, as well as diffraction by two and multiple slits, near field, multiple slit gratings and photographic gratings, refraction by prisms, dependence of diffraction on wavelength, and disks and zone plates. The manuscript reviews the properties of holograms and zone plates. Discussions focus on holograms and coherent radar, single wavelength nature of holograms, image inversion, reconstruction with a small portion of a hologram, pseudoscopy in the real image of a hologram, zone plates as negative lenses, offset zone plates, and zone plates with areas interchanged. The text is a dependable reference for researchers interested in coherent optics.